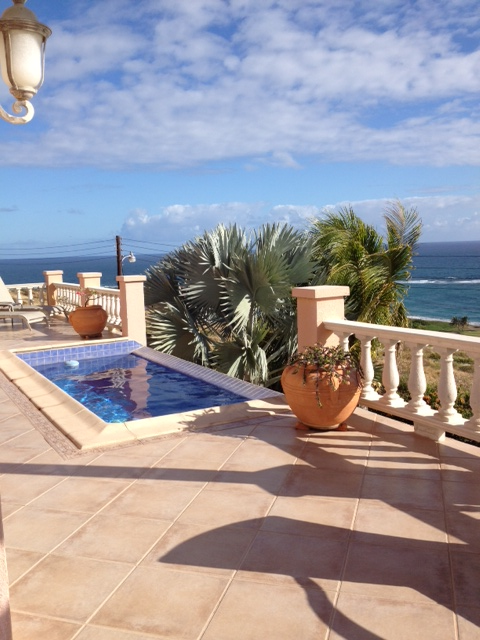 St Kitts real estate, upscale homes for rent in St Kitts and Nevis. 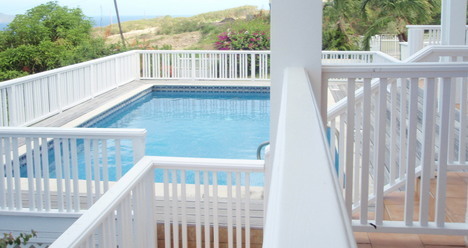 3 bedroom 2.5 bath fully-furnished main house in Frigate Bay for long-term rental. This house is equipped with a security alarm system and air-condition in ALL bedrooms. Furnishings include 2 LCD tvs and washer/dryer. This fully-fenced house with automatic sliding gate boasts a spacious living room on the lower level, a spacious family room on the upper level and covered garage. The house affords views of the Marriott resort, Atlantic ocean, Southeast Peninsula and Frigate Bay hills from almost every room on the upper level. 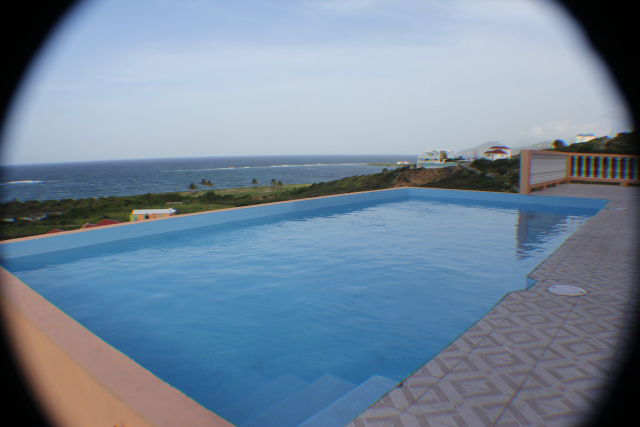 Lovely 2 bedroom 2.5 bath fully furnished spacious main house with private pool and BREATHTAKING VIEW for rent in Half Moon Heights, St Kitts. This house contains 2 spacious bedrooms, both with ensuite baths. The house enjoys a cool breeze year-round. However, for your added comfort, this house is als air-conditioned. This beautiful home comes equipped with security system, washer, dryer, dishwasher, microwave, etc. The house boasts designer (Scavolini) kitchen. "A PET WILL BE CONSIDERED"
Long-term monthly rent: "SORRY, NOT AVAILABLE"
3 bedroom 3.5 bath recently completed fully furnished magnificent home with POOL for rent in Half Moon Courtyard. This fully fenced house sits on a 1/4 acre lot and provides a spectacular view of the Atlantic ocean. The recently built house boasts 110/220 volts, granite counter tops and double car garage. The house is equipped with almost new furniture and appliances including, washer, dryer, microwave, cable tv, etc. 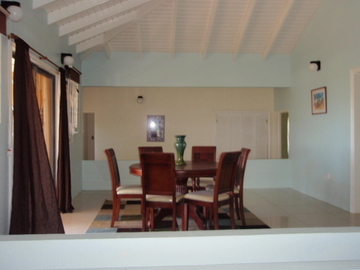 Spacious 2 bedroom 2 bath UNFURNISHED fully fenced main house for rent in Shadwell, St Kitts. This well-maintained home constructed in 2000, offers air-condition in both bedrooms, 110V/220V, burglar bars, screens and hot water. Both bedrooms and bath are on the upper level, while laundry/storage, open plan kitchen, dining and living area are on the lower level. 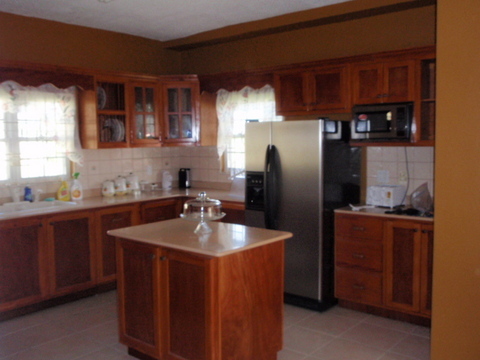 Property is within walking distance of the capital city, Basseterre. House is located on spacious beautifully landscaped grounds with mature fruit trees and ornamental trees. Four bedroom 4.5 bath fully air-conditioned house with spectacular view for rent in Frigate Bay, St Kitts. This 4,800 sq ft house sits on a 1/2 acre lot and is also designed to be used as a 3 bedroom 3.5 bath main house with a separate 1 bedroom apartment. The house is light and airy and provides a stunning view from every room. The apartment comes fully furnished while the main house is semi-furnished with all major appliances including dishwasher, microwave, washer/dryer and patio furniture. However, if you would prefer to rent fully-furnished, this could easily be arranged. The house boasts large swimming pool, electronic gate, double car garage with automatic gate opener, automatic standby generator, well-manicured lawn with mature fruit trees and ornamental trees, magnificent view of both oceans and Frigate Bay area. The lower level with large room and bar leading out to the pool deck were designed for your entertaining pleasure. For the Executive who loves to entertain - "This house is for you"! SIMPLY STUNNING! Newly refurbished Executive 3 bedroom 2.5 bath fully-furnished home with large semi-detached office and double-car garage with automatic gate opener for rent in Frigate Bay, St Kitts. You'll be easily captivated by the view from this bungalow and especially pleased with the decor. This house has a wonderfully thought out design and provides an extended and large patio for your entertaining pleasure. The house sits on a 1/4 acre lot and provides a panoramic view of the Marriott resort, Royal St Kitts Golf course and both the Caribbean Sea and Atlantic Ocean. There is a cool breeze year-round. However, for your added comfort, all bedrooms and semi-detached office are air-conditioned.Once you enter this house, you'll want to make it your home.